Blackwell resident Philip Denyer tells of the efforts to ensure his great-great uncle is remembered. Four years ago, my mother asked me to help her with researching the family tree, and this began my interest in family members who had served in the First World War. However, my great-great uncle, John Stevens, was almost overlooked. He was a local lad, the eldest son of Joseph and Mary Ann Stevens’ twelve children, and was born in Upton Warren near Bromsgrove in 1882. The family later moved to Great Stone Farm at Finstall. John enlisted in 1904 and served in the Royal Field Artillery for most of the war. He fought in France – and, interestingly, in Italy, which not many British soldiers did. In 1918 he was admitted to a war hospital in Bradford. It was the start of a prolonged period of illness, which was caused by an ear infection leading to meningitis, loss of hearing, and facial paralysis. He was discharged from the Army in 1918 and died aged 38 in Handsworth, Birmingham, in 1920. I searched the Commonwealth War Graves Commission (CWGC) records in 2012 but did not see John’s name, so I assumed that as he died after the war ended, he would not be listed. It was not until my research led me to St James Church in Handsworth – to see if John’s brother Daniel’s name was on the war memorial there, as he also lived in Handsworth – that I found the name J Stevens. I checked this with a contact I had made on the Great War Forum, and he confirmed that this was indeed my relative. It was then pointed out to me that John’s name had recently been added to the CWGC list of war dead by an addendum panel, and was to be added to the Brookwood Memorial in Surrey for those soldiers who had died due to the First World War but had no known grave. Later, via the Bromsgrove branch of the Birmingham & Midland Society for Genealogy and Heraldry, I made contact with David Sutcliffe of the “In From The Cold” project, which was founded more than 10 years ago to research and identify all servicemen and women missing from the official CWGC list of casualties from the First and Second World Wars. I learned that it was David who had discovered in 2010 that John Stevens was one of those missing from the official records, and was responsible for researching John and putting a case together that he should be on the CWGC list of war dead. More than 5,000 cases have been processed and have resulted in the CWGC officially commemorating 3,606 names – including John’s – with some 1,686 still outstanding. After hearing that John was now on the CWGC list, we quickly found his burial records online and went to Handsworth Cemetery to search for his grave. After much searching we found it: unmarked, but between two CWGC graves for privates from the Royal Warwickshire Regiment who had died about the same date. We then contacted the CWGC, filled out the relevant forms and sent in the appropriate evidence, and they agreed to give John a CWGC headstone so he can be properly commemorated for his sacrifice. We are delighted that the headstone has now been installed. It is possible to add a personal message to the inscription, so after some careful thought we decided that “Remembered and Not Forgotten” seemed appropriate, because finally John is indeed remembered and not forgotten through the efforts of myself, my mother and David. As readers may recall from a Village article in February 2015, the names of John’s two brothers, George and Daniel Stevens, are inscribed on the war memorial in Aston Fields. However, there is one mystery remaining about John, which we would love to solve. On this memorial there is a J T Stevens, yet the Roll of Honour kept in Bromsgrove Library – which has entries for all the other soldiers on the Aston Fields memorial – has no such name listed. Could this be our John Stevens after all? John didn’t have a middle name, but his brother George’s middle initial was T – so could a mistake have been made on the memorial? With John dying in Handsworth after the war ended, perhaps the researchers for the Bromsgrove Roll of Honour did not find him listed among the local war dead. We may never know! If there are any descendants of the Stevens family out there who may have a photo of John, we would love to have a copy. 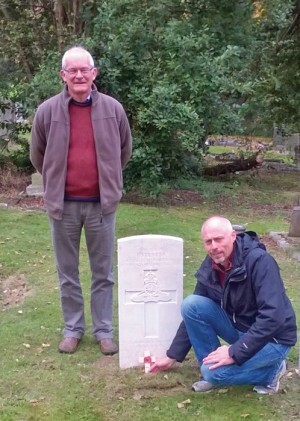 Right: David and Philip with John’s headstone.